Nancy Ehlen Oakes (BS ’83) anticipated she would have a wonderful time on her BYU Alumni Association tour to Church history sites. What she didn’t expect were the lasting friendships her children formed on the bus and the testimonies they bore when they returned home. 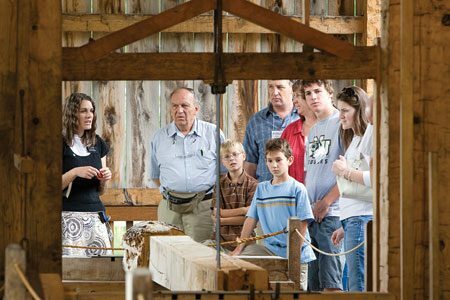 Members of the Wessman and Oakes families tour a sawmill in Kirkland, Ohio. 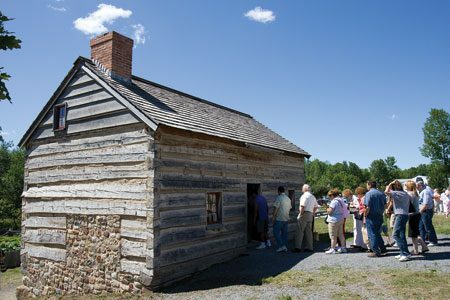 The two families met and created lasting friendships during their nine-day Alumni Association Church history tour, which included the Joseph Smith log home in Palmyra, N.Y.
“It was a life changing experience for all of us,” she explains. The El Cajon, Calif., mother and her husband, Robert E. Oakes (BS ’85), had saved “a long, long time” so seven members of their family could experience the sacred sites firsthand. After flying to New York, the Oakes traveled in a motor coach for nine days with nearly 50 other people intent on learning more about the early Church. The group’s stops included Palmyra, N.Y.; Kirtland, Ohio; Independence, Mo. ; Nauvoo, Ill.; and areas surrounding these destinations. web: For information about Alumni Association tours, visit alumni.byu.edu/tours.